Chocolate Mint is a cultivar of mint, a member of the very large Lamiaceae family. Rich in vitamins A and C, and containing trace amounts of manganese. 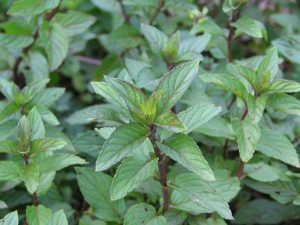 Chocolate Mint has similar medicinal actions as peppermint and spearmint however it is most commonly used for its chocolatey minty flavor in cooking, specifically with deserts. As a cooling herb, chocolate mint can be used to calm overheated conditions and to sooth digestion. Chocolate Mint can be made into a tea or tincture however it is Most often used to flavor deserts and beverages. Prepare a tincture using the above parts. To use the tincture, take 1/2 to 1 teaspoon three times a day for 3 to 4 weeks. Results may be subtle, but generally after 2 to 3 weeks people notice they have better memory recall.